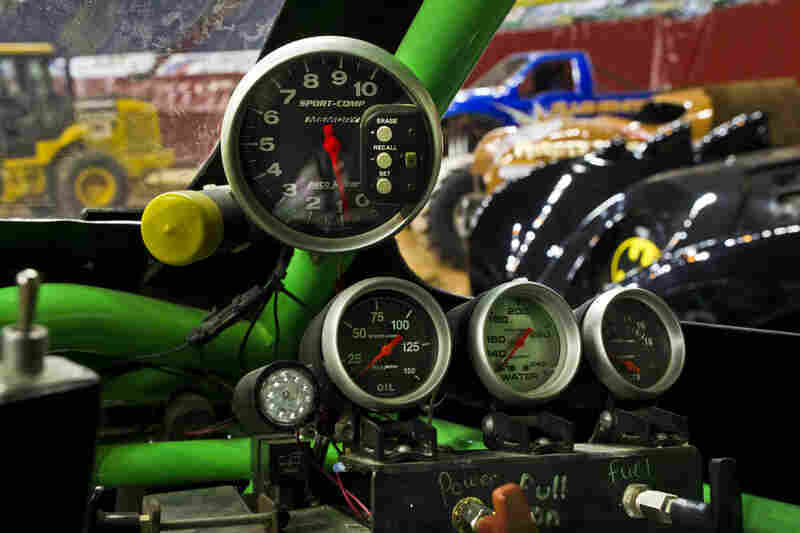 The Grave Digger team of monster trucks, considered to be one of the most influential monster trucks of all time, is currently celebrating its 30th anniversary and racing in the United States Hot Rod Association (USHRA) Monster Jam series. 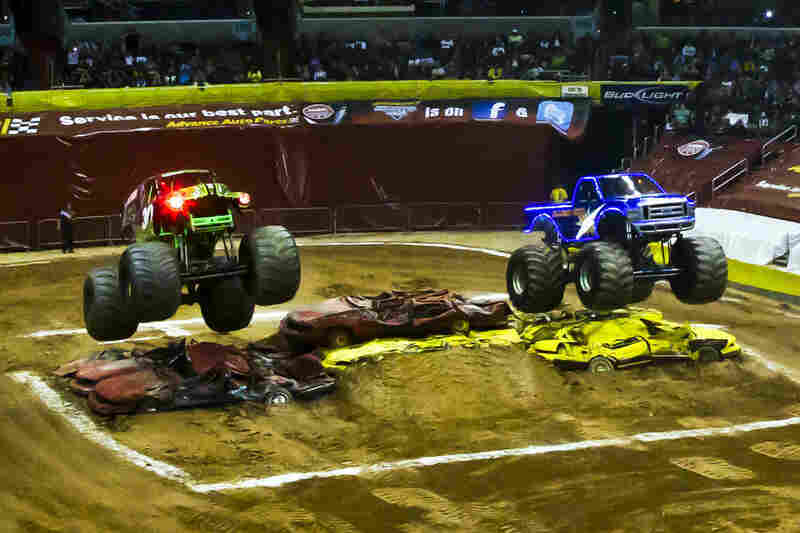 The Monster Jam tour begins in the late winter each year and ends in March — visiting major cities in the U.S., Canada and Europe. The large venues that host these events, such as Washington, D.C.'s Verizon Center arena featured in this photo, begin their preparations for the show almost three weeks before the night of the event. After laying down a 10,000-yard stockpile of dirt with an 8- to 10-inch base, the constructing of the obstacles begin. Junkyard cars from towing companies are brought to the arena and painted over with vibrant colors to enhance the audience experience. Rod Schmidt, the current driver of the Grave Digger #18 truck, has been driving for the team for more than a decade and says it's "the greatest job ever." The Grave Digger's imagery of green flames and foggy graveyard scenes has earned it a wild reputation and unceasing popularity. The trucks have become the poster child for Monster Jam, and in some cases monster trucks in general. The Grave Digger #18 was constructed from a 1950 Chevy Panel Van with a 540 CI size engine and a Coan 2-speed transmission. Sitting in the driver's seat of the car, one sees the immensity of the estimated 10,000 lbs. truck — standing at about 11 ft tall and 12 ft wide. Every Monster truck is equipped with three safety shut offs. As seen from the front seat, the driver has one on the inside of the truck; another is clearly marked on the rear of the truck; and an official holds a remote kill switch in case the safety of onlookers is compromised. One of the Grave Digger's most visible trademarks is the red headlights that glow menacingly whenever the truck is in side-by-side racing competition. The first truck to cross the finish line moves onto the next round until it is eliminated or triumphs over the competition. 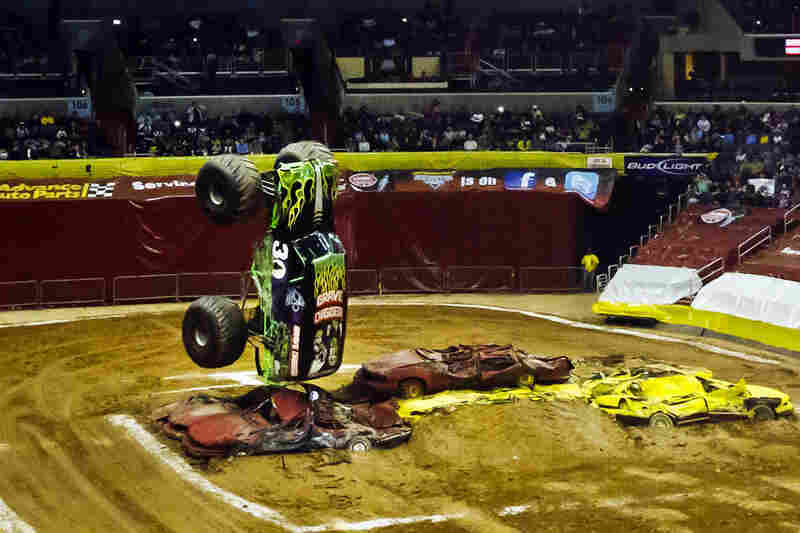 Grave Digger driver Rod Schmidt stuns audiences inside Washington's Verizon Center, as he takes his monster truck vertical towards the end of the show. Today, the Grave Digger is traditionally the last truck to freestyle and is featured in the "grand finale" which caps off the show. The Grave Digger truck received its name in 1981, when its builder Dennis Anderson, jokingly trash-talking with his fellow racers, said the now famous line, "I'll take this old junk and dig you a grave with it!" 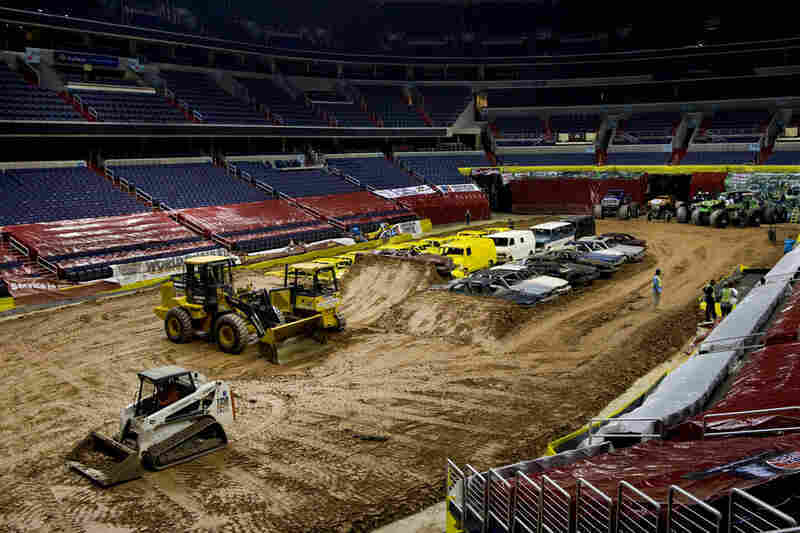 Monster Jam events draw more than 4 million people to arenas like the Verizon Center in downtown Washington, D.C. What started in the late '70s as intermission entertainment for tractor-pulling competitions is now a multimillion-dollar industry that tours the world. 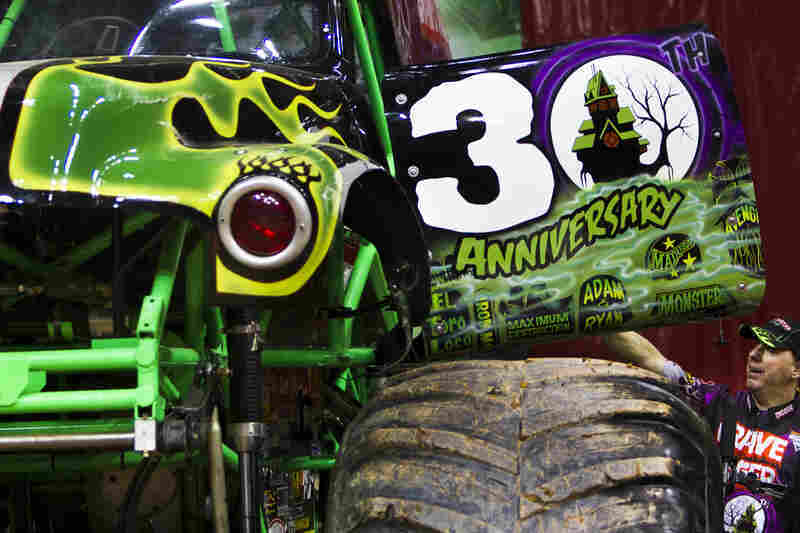 This year's marquee star is Grave Digger, a team of drivers and trucks that's celebrating its 30th anniversary. 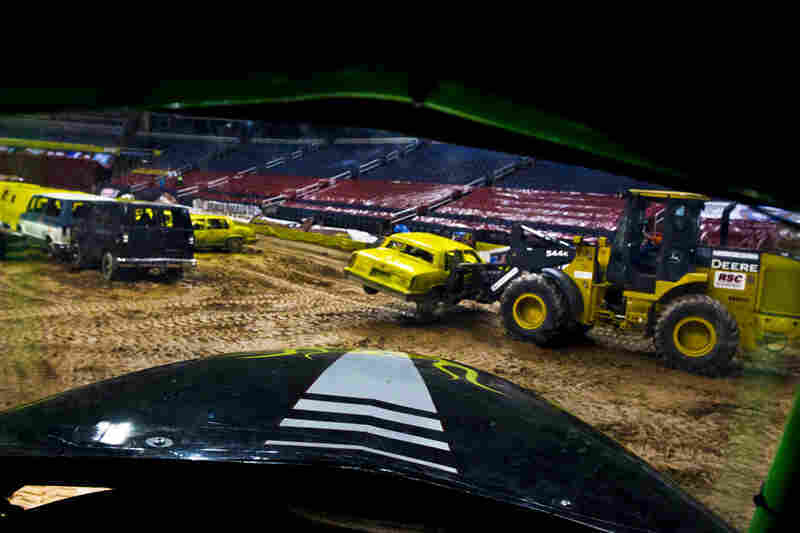 We sneak into the arena before showtime at a D.C. Monster Jam show in late January to find out what it's like behind the wheel of "the black and green wrecking machine." The basketball court at the center of the arena has been replaced by a stockpile of red dirt. 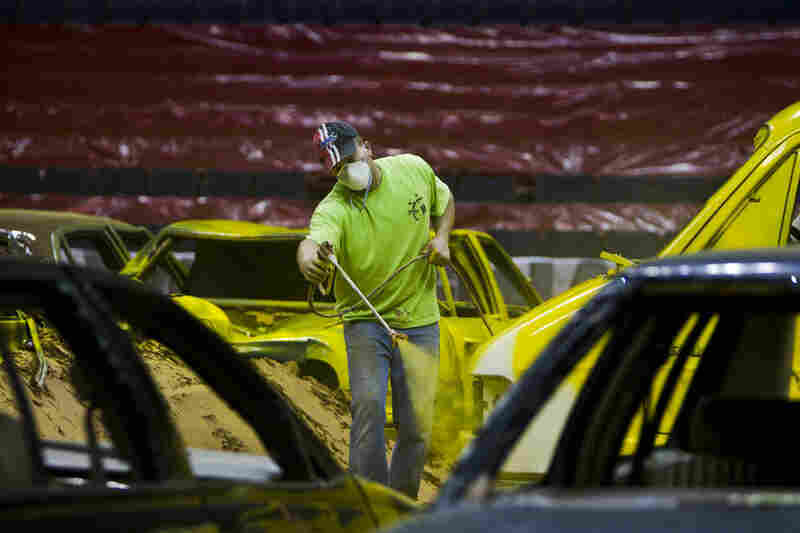 As part of the last-minute preparations, workers spread the dirt around the floor and paint junkyard cars in the middle of the pit. Rod Schmidt, one of Grave Digger's drivers, gives us a tour of his truck. "Are you ready to get in?" he asks. "I can tell; your eyes are getting bigger. You're like a crazy fan right now, I love it." Obviously, Grave Digger is big — elephant big. It's twice the height of the average basketball player. On the outside, there's a ghoulish skeleton head painted on the black cab and bright green flames painted on the hood. It sits on a neon green frame and shock absorbers the length of hockey sticks. At 5 feet 4 inches, I'm not quite as tall as the hand-carved tires. With Schmidt's help, however, I manage to climb my way into the cab, which has been stripped bare except for a single driver's seat and some ominous looking buttons. A mud bog hobbyist named Dennis Anderson built the original Grave Digger in 1981 out of a '50s era Chevy and the wheels of a tractor. The truck became a huge hit because of its horsepower and ability for maximum destruction. The fiberglass-covered machine Schmidt shows me is far more complex. He shouts out some numbers: It weighs about 10,000 pounds; it's approximately 11.5 feet tall; each tire weighs about 600 pounds; it has a 1,500 horsepower engine; it gets about 10 gallons to the mile. A truck like this will run you up to $200,000, and that's before you buy the semi to take it on tour. 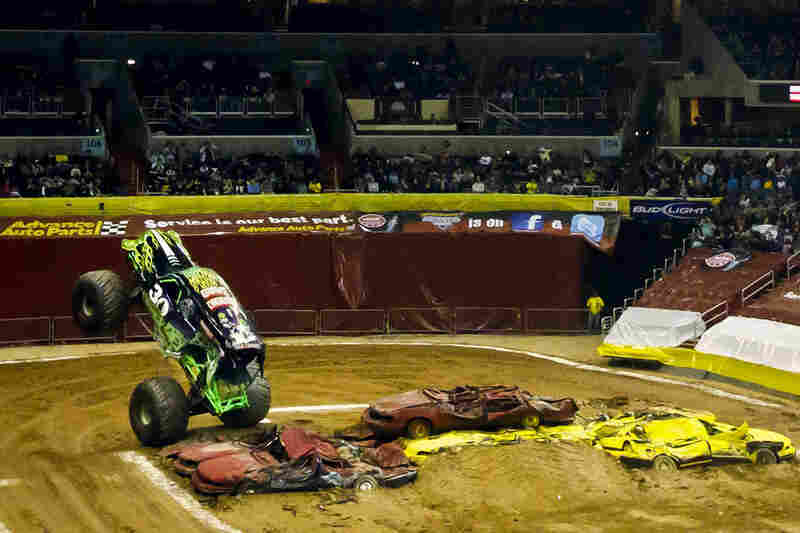 The sport — yes, sport — of monster truck driving has come a long way. According to Schmidt, it's not just about crushing cars anymore. "We crush the cars, yes. But do we crush them like we used to in the old days? No," he says. "We bang them up a little bit; we smash in the roof and smash in the sides, but not nearly as bad as we used to." For one thing, the truck is so shock absorbent that rolling over a full-size sedan feels a little something like hitting a pothole. "It's a bump in the road," Schmidt says. So instead of driving over a bus and calling it a day, monster truck drivers now compete for trophies and sponsorships. They go head-to-head in racing competitions, leaping over massive dirt ramps. In the freestyle segment, they earn points for tricks like standing the trucks up on their back wheels or flying 100 feet in the air over stacks of cars and rows of school buses. It's kind of like a figure-skating routine, but much louder. "We go by a rule book like every other race association," Schmidt says. "People think it's a show and it is a show — it's entertainment — but we also race. We race for real and we freestyle for real. We race for points, we freestyle for points. And that score gets calculated throughout the year so you get power-ranked. So we are a show, but yet we're racers." When he isn't sporting a 10,000-pound ride, Schmidt drives a GMC Yukon. He says his driving styles inside and outside the arena are pretty different. "I'm a pretty good driver. I'm pretty calm," he says. "I drive a little faster than I probably should, but I take all my frustrations out here. It's like an alter ego. I get to come out here and just absolutely have fun with this thing and I go back to my regular car and it's la-di-dah." 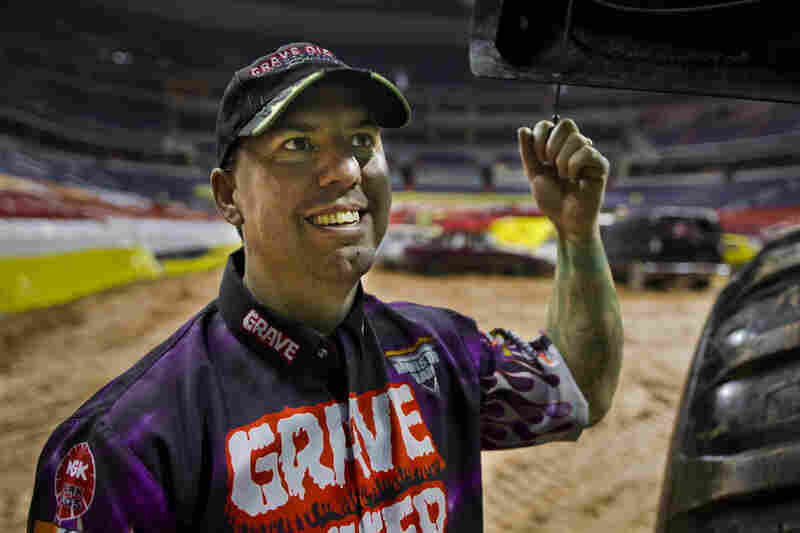 Schmidt has been driving Grave Digger for more than a decade. He says that even after all that time, it's just as exciting as when he started. "Sitting back there listening to the national anthem and stuff, your heart starts beating a little faster," he says. "You can kind of hear the fans. Your blood starts pumping. And as soon as they give you the green light to hit the floor, you're on the gas."